Keep your new AirDome firmly in place and staked to the ground with the Vitabri Light Wind Stake Kit, designed with simplicity and durability in mind. 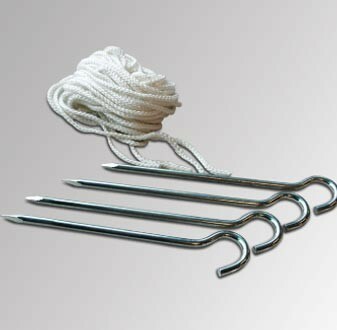 This kit includes four stakes, four ropes, and a storage bag to keep it all together and organized when not in use. The ropes fasten to the canopy's stainless steel ballast connectors, so securing your tent can be easy and hassle-free. The stakes, available in chrome finish, will hold your tent firm in light winds and inclement weather. For more severe weather and high winds, please consider our professional-grade stakes, designed to withstand harsh elements.